Advanced link builders aren’t super-humans, but that doesn’t mean some in the SEO industry don’t look upon them as if they are. What separates a good link builder from the rest of us is the ability to properly audit a link prospect, and, even better, the ability to do it quickly. If you’re an SEO who is new to link building, saddle up, because I’m going to show you how to flex your link building brain and get better at spotting the gems among the junk. Outlined below you’ll find what I’ve called the power audit. It will give you a 1000-foot view of the page you’re looking to get a link from and help you determine whether it’s worth the effort. From there, you can do a little more investigating to strategize how you’ll approach your prospects. You can also download the Link Prospect Power Audit PDF and print out a desk reference version of the steps. Step One: Does the site offer value? Were built just to sell ads. Have malware or other warnings. Were built for search engines, not users. Do not offer relevant, unique content. If it passes the initial snuff test, head to Step Two. Step Two: Does the site have suspicious outbound links? Do not appear to be related to the content of the site. Link to spammy sites or sites in a bad neighborhood. Are hidden in the code or content. Appear to be paid and not disclosed. Step Three: Does the site look “healthy”? *Review backlink history by using a tool like OpenSiteExplorer.org or MajesticSEO.com. Group the backlinks by domain and check again to see if the top links are from sources relevant to the content on the page/site. Not all of them have to, but the top links really should contain relevant content links. Step Four: Does the site get traffic? Run it through either google.com/adplanner or compete.com and get a bird’s eye view (not exact) of how much traffic the site gets. 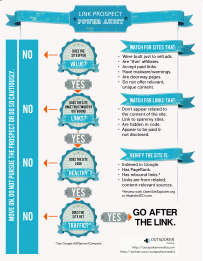 This will help you determine if you can expect any click-thru traffic. If your prospect has passed your micro-audit, the URL should be saved in your master list (an Excel file would be fantastic, or use a paid solution Raven SEO Tools or Buzzstream) for later. This is a link you should go after. The idea here is to grow your master list of prospects so that you can then spend more time with it later. When your list is complete, you can determine what type of link you hope to get (e.g., a guest post, directory listing, site-wide link, etc.) and start to strategize your approach/pitch. It probably goes without saying, but if your link prospect doesn’t pass the audit checklist, move on and do not pursue the link (or do so cautiously). This strategy is built for speed and it should help the SEO new to link prospecting learn how to flex their link audit muscles. For the more experienced link builder, it’s a good way to get a quick overall picture and/or help train other link builders to spot good prospects. By no means should it replace a full-on audit of link prospects as there is much more that goes into finding and qualifying them, but for those who need a strategy on-the-fly, this works great. The power audit is just a piece of the link building pie, so from here you’ll want to develop an actionable link building plan. Go ahead, download and print out the Link Prospect Power Audit PDF and use it as a quick desk reference of all of the steps I’ve outlined above.